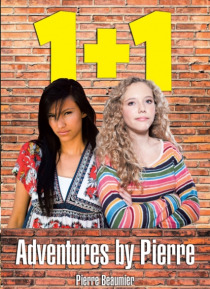 1 + 1 is a story about experiences that students live in high school, between grades 9 and 12 and also at teenager levels. The story develops in a medium-sized city in an average neighborhood at an average secondary school. When two students experience the same life challenge at the same time, but they deal with it each in their own way by themselves, then its just one person having a challenge pl… us another having a challenge1 + 1. They dont help each other or communicate with each other because they are from extreme ends of todays society. Therefore, even the society they are surrounded by treats them as one in trouble plus another one, not a pair. One is from a stable and well-organized family; the other, from a low-income social securitydependent family. Because of their lifestyles and choices, they cannot be seen together, let alone talk to each other. It would take quite a situation to break that trend. This story is not written by a professional book writer; it is written by a passionate and caring father who most certainly has daughters. There is a popular saying that goes like this, How to make a grown man cry? Give him a daughter. From this book, you will see that it is obviously true. And yes, I have three daughters. Be ready for an emotional roller coaster as the story develops. Although this is fictional, it has probably happened to someone somewhere. Could it have happened to you? Could it have happened to someone close to you? Absolutely! I hope you enjoy reading this. I really feel every teenager from fifteen or those aged thirty-five, boy and girl, should read a story like this.